How does one review a systematic theology by one of the leading minds of the evangelical world? How does one summarize the thoughts of a 1,100-page book that towers with truth; a book that takes readers to the top of the theological mountain? Anyone who attempts to read and devour Systematic Theology by John Frame will be faced with such questions. Indeed, while the oxygen is scarce at the top of this theological peak, readers will be delighted to enjoy the view that Dr. Frame presents. As one might expect, every branch of systematic theology is explored. The author invites readers on a journey which introduces them to God who relates to creatures as their covenant Lord. The three lordship attributes are articulated throughout the book – control, authority, and presence. 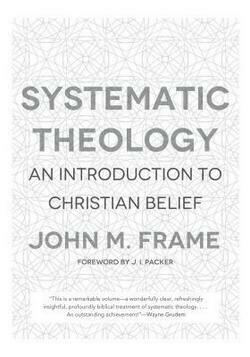 Systematic Theology: An Introduction to Christian Belief by John Frame is a theological tour de force. This weighty volume is drenched with Scripture and is drowning with biblical wisdom. I cannot think of any other writer who has influenced my thinking, outside of Jonathan Edwards himself. This work is a true labor of love, a gift to the church, and a tool that will sharpen the minds of Christ-followers and serve as a heart-tenderizer for many years to come! I have been teaching theology for over twenty-five years. During that time span, I have been privileged to use some of the finest theological resources available. Contemporary books like Wayne Grudem’s, Systematic Theology: An Introduction to Biblical Doctrine or John Frame’s Systematic Theology: An Introduction to Christian Belief have been a never-ending source of theological wisdom, and have instructed and encouraged my soul. Books geared to laymen like J.I. Packer’s, Concise Theology: A Guide to Historic Christian Beliefs and R.C. Sproul’s, Essential Truths of the Christian Faith have also proven themselves to be faithful friends. But despite the wealth of resources for pastors and teachers, very few provide insight for actually teaching theology. For this reason, Gregg Allison’s new book will be a welcome addition to many personal libraries. 50 Core Truths of the Christian Faith: A Guide to Understanding and Teaching Theology is part systematic theology and part pedagogy. Indeed, it is a tool to be reckoned with. A brief look at the table of contents reveals what initially looks like a traditional systematic theology text. Eight branches of systematic theology are arranged from the doctrine of the Word of God (Bibliology) to the doctrine of future things (Eschatology), respectively. Each branch is subsequently arranged into bite-sized pieces which are designed to be easily digested by the reader. Understanding Doctrine – Major affirmations, biblical support, and major errors associated with a particular doctrine. Enacting Doctrine – The case for teaching the stakes for minimizing, marginalizing, or repudiating a particular doctrine. Teaching the Doctrine – Practical pointers and help with teaching a particular doctrine. 50 Core Truths of the Christian Faith: A Guide to Understanding and Teaching Theology succeeds in carrying out the aims of the author. It is a treasure chest of biblical wisdom that will encourage and educate. Many pastors, teachers, and professors will benefit from this well-sharpened tool which will lead to the edification of the saints and glorify the Triune God! It was one of the most dramatic conversion experiences in redemptive history. The apostle Paul, formerly Saul of Tarsus was miraculously transformed into a man who found his delight in God. Guy Prentiss Waters tells the story of Paul’s conversion in his latest book. The Life and Theology of Paul not only unpacks some basic biographical details about the apostle Paul – it explores the basics of Pauline theology. In some ways, this work is a mini-systematic theology. While the author does not cover every branch of theology, he does present Paul’s hamartiology, soteriology, and the ecclesiology. Also, included is a brief discussion of personal eschatology. Each chapter concludes with a section of practical application. Here, the author presents real-life principles that readers should wrestle with and apply to their lives. The Life and Theology of Paul is accessible to a wide range of readers and is a faithful treatment of Reformed theology that will provide deep encouragement for many people. It is my privilege to commend this new volume and trust that it will receive a wide reading. Dr. Gregg Allison leaves no stone unturned in his newest work, Sojourners and Strangers: The Doctrine of the Church. Allison’s fine piece of work is the latest installment in the Foundations of Evangelical Theology Series, edited by John Feinberg. Six majors themes form the skeletal structure of Sojourners and Strangers. The author presents his methodology for ecclesiology. Realizing that one’s approach in this area has broad implications, Allison contrasts theological methods that embrace continuity and discontinuity between the testaments. He stands somewhere in the middle of this debate by describing himself as one who embraces a moderate discontinuity, what some have described as progressive dispensationalism. His conviction has a bearing on his view that concerns the origin of the church and the relationship between the church, Israel, and the ordinance of baptism. This hermeneutical criteria is a helpful backdrop that serves the rest of the book well. Allison’s hermeutical presuppositions are refreshing to be sure because while on one had he distinguishes himself from the covenantal framework, he also distinguishes himself from classical dispensationalism, i.e. “the church stands in both continuity and discontinuity with the people of God in the past.” Near as I can tell, he is an agreement with the essence of the proposal but forth by Peter Gentry and Stephen Wellum in their excellent work, Kingdom Through Covenant. Additionally, the orientation of the church is established in part two by examining seven characteristics of the church. 1. The Church is Doxological – oriented to the glory of God. 2. The Church is Logocentric – focused on the Word of God. 3. The Church is Pneumadynamic – empowered by the Holy Spirit. 4. The Church is Covenantal – with God and in covenant community with one another. 5. The Church is Confessional – united by a common Christian confession or creed. 6. The Church is Missional – called to proclaim the gospel and advance the kingdom of God. 7. The Church is Spatio-Temporal/Eschatological – a historical reality with a grand future. Allison explains each characteristic in great detail and suggests practical suggestions for abiding by the biblical model. Part three demonstrates how the vision set forth in the previous section will be fostered and protected. This vision will be actualized by maintaining the purity and unity of the church. Additionally, the commitment to church discipline plays a key role. Church discipline is defined as “an anticipatory and declarative sign of the divine eschatological judgment, meted out by Jesus Christ through the church against its sinful members and sinful situations.” Churches who neglect or reject church discipline do great harm to its members and the testimony of God’s people. In this critical section, Dr. Allison unpacks the offices of the church. First, he examines the office of apostle which is “no longer operative” in the author’s view. He continues to explore the office of elder and deacon, noting the biblical qualifications and responsibilities of each. The subject of church government is set forth in a clear and understandable way. Episcopalianism, Presbyterianism, and Congregationalism are explained in their historical context. The author presents his proposal for the governance of congregational churches – a model that is elder-led and congregationally affirmed – which appears to be the biblical model. The various views of baptism and the Lord’s supper are presented in light of church history. Disagreements that the author has with other views are set forth with charity and graciousness. Finally, Allison overviews the various spiritual gifts, a biblical theology of worship, and various ministries that emerge in the local church context. The church should be “for the world and against (the sinful corruption) of the world. I cannot recommend Gregg Allison’s work highly enough. His treatment of ecclesiology should be applauded for its depth and breath. And it should be celebrated for its gracious approach to disputable matters. Readers will be remiss to find a shred of compromise or capitulation; yet his gentle approach weaves throughout the fabric of the book. Sojourners and Strangers should be required reading for every Ecclesiology class for Bible College students and Seminarians alike. This book will not only instruct and educate; it will help stem the tide of errors and mis-steps that have so characterized the last several years of church history, especially the blunders that have come out of the emergent and seeker-sensitive church. I would also refer readers to his excellent work, Historical Theology for a superb look at the development of Christian theology in church history. The title of Greg Forster’s book will prompt one of two responses: People will mutter inappropriate words under their breath or they will rejoice in the truthfulness on the cover. The Joy of Calvinism is meant to be a buffer to the traditional arguments that have ransacked Calvinistic theology for decades. And Forster accomplishes his task with a great deal of skill. Good books on systematic theology are rare commodities these days. Wayne Grudem published his phenomenal book, Systematic Theology in 1994. Robert Reymond followed Grudem in 1998 with A New Systematic Theology of the Christian Faith. Since those seminal works were published there has been a virtual void. The work is saturated in Scripture and engages with competing worldviews and philosophies. 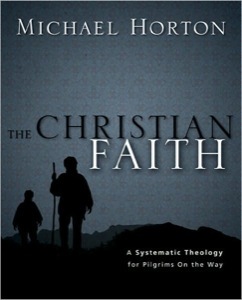 While some are critical of Horton’s choice to interact with pagan philosophy, his decision adds to the overall value and usefulness of the book. Engaging on a philosophical level helps readers better establish a strong and coherent Christian worldview. In my mind, Horton reaches his zenith in Chapter 15 with a mind-numbing and soul titillating discussion on substitutionary atonement. One significant critique worth noting that comes as a real surprise. Horton argues, “Jesus Christ, sinless in himself, becomes the greatest sinner who ever lived …” (p. 621). Much to the contrary, Scripture teaches that God made Christ to “be sin” (2 Cor. 5:21). Additionally, Scripture teaches that Christ has been tempted in every respect as we are “yet without sin” (Heb. 4:15). God’s Word never declares that Christ becomes a “sinner.” One wonders if a typo has occurred here! Dispensational thinkers will disagree with Horton at points. Overall, though, Horton’s work is a real winner and will be utilized in the Seminary classroom and pastoral study for years to come. Each section contains a short, but extremely pointed summary of a particular doctrine. The book is not designed to be a comprehensive systematic theology. Rather it is written with the layman in mind who has a desire to learn doctrinal truth or may not have the time to devote to a larger work. The precision with which this book is written may encourage readers to study further in a given area. J.I. Packer continues to write in a way that many have grown to love and expect. Three basic strengths must be noted. First, the author emphasizes the greatness and majesty of God. Packer emphasizes that “theology is for doxology.” He writes, “The truest expression of trust in a great God will always be worship, and it will always be proper worship to praise God for being far greater than we can know.” Second, Concise Theology is a superb introduction to Reformed thought. Yet the author does not “wear his theology on his sleeve.” This work may appeal to a broad range of people who otherwise may be reluctant to study Reformed theology. Finally, the most controversial points of Reformed theology are dealt with in an honest and forthright manner. The most engaging essays include Packer’s discussion on particular redemption, the enslaved will, effectual calling, and the constitution of man. The church owes a tremendous debt to Dr. Packer’s faithful ministry over the years. May his tribe increase!